Derry City rolled their sleeves up to secure a point at Cork City. John Caulfield's men in the second half had a lot of the ball never really test Derry goalkeeper Peter Cherrie. The ex-Cork netminder along with his back four back were assured throughout. 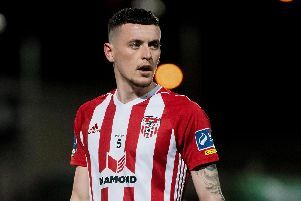 At the other end, Derry centre-back Ally Gilchrist went close to scoring as his long range drive was tipped over by Cork keeper Mark McNulty. While right at the death Derry substitute Aidy Delap saw his long range drive deflected wide, as the visitors went in search of a late winner. Cork City's Conor McCormack tussles with Derry City skipper Barry McNamee.